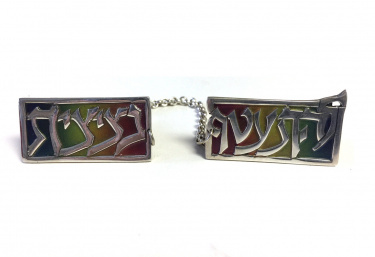 Renowned for their exquisite Kiddush cups, candleholders and other Judaica items, the Nadav family produces top-of-the-line sterling silver heirlooms. The intricate filigree detail on many of their products is the hallmark of Yemenite silversmiths. In this pair of tallit clips by S. Nadav, the clips are outlined in sterling silver (as is the clip itself), with a beautiful blue to red enamel collage in the background. Written on them is L’hitateif BaTzitzit (to wrap oneself in TzitTzit). Measures 1 1/3"L x 1/2"H. Enamel color may vary. Made in Israel.